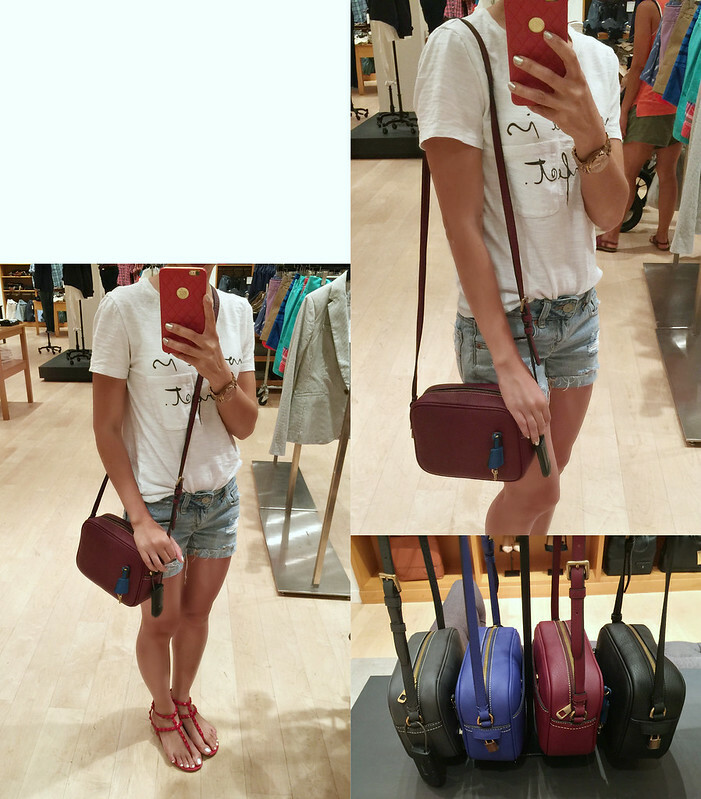 Gucci Soho Disco bag: This bag is getting more popular by the day. I've seen quite a few of them on bloggers. It's cute, functional and the price point isn't so bad for a designer bag. However, I am personally not a fan of tassels (not just on this bag but in general). Tassels and fringes are not my cup of tea. Since the tassel is not removable, I don't think I can live with it. This is how the bag looks on me. I like the size and the fact that the shoulder strap is adjustable. It's available in a variety of colors. Saint Laurent Blogger bag (love the name!). 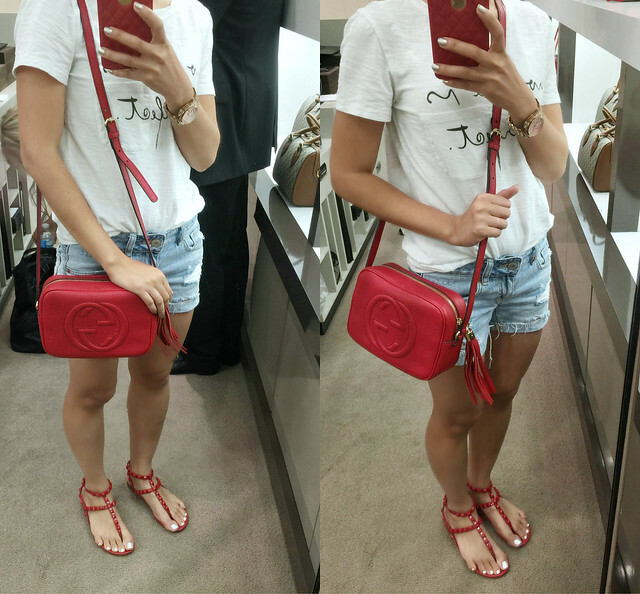 I didn't try it on but personally don't think the bag is worth the price tag ($995). It's super tiny and the leather feels kind of cheap. The iPhone 6 plus won't fit in the bag (maybe the 6?). Again, the tassel is huge. This is my least favorite out of the bunch. J.Crew Signet bag: On the flip side, this is my most favorite bag that I've tried on that day. For around $100, I think this is a great bag! I absolutely love the textured leather. I prefer the luggage tag to be the same color as the rest of the bag but someone might find the design interesting. Also, I am not a fan of the contrasting stitching but it's not a deal breaker for me. I like the muted/understated gold-tone hardware. It's available in 7 gorgeous colors. 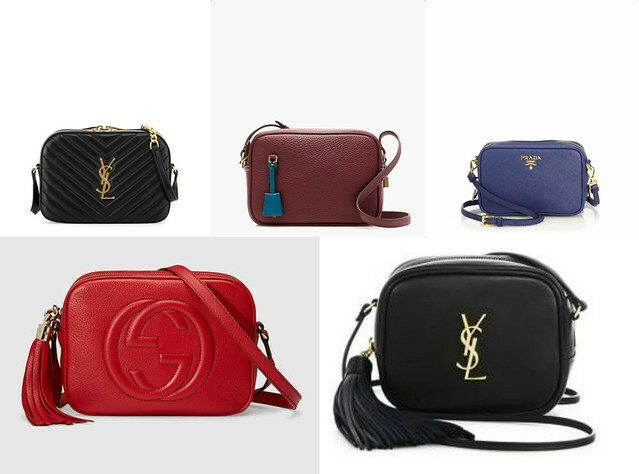 Saint Laurent small camera bag: This is another version of their camera-style bag. However, I love this one. I haven't seen this bag in person but I like the overall design much better than the blogger bag. The chevron patterns and the luggage tag add a modern touch to the bag. Prada camera bag: This is another bag that I have not seen in person. I like the minimal design without a lot of bells and whistles. It's almost $250 cheaper than the Gucci Soho Disco. I am a fan of saffiano leather but have a love hate relationship with Prada. My final thought: If you adore the camera bag trend but don't want to spend too much money, I would suggest getting the J.Crew Signet. If you have the money to splurge, the Saint Laurent is definitely on top of my list. Have a wonderful weekend, everyone!